To a large extent, the physical and thermodynamic properties of glasses are controlled by their inner structural make up within the so called short range order (SRO) and its extended viewing as modulated structures identified as medium range order (MRO) [1–5] often adjacent to nano-crystalline arrangements. 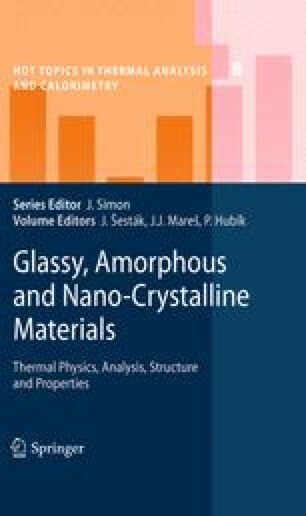 Study of physical nature of nano-scale in-homogeneities in glasses (and in their melts) [6, 8] provides glass inventors with basis for elaboration of glasses of a required state, from extremely homogeneous glasses (optical fibre drawing) to nano-crystallized and/or porous-containing glasses suitable for various application (sorbents, molecular filters, bioglasses, zero-expansion glass-ceramics, matrixes for nano-scale crystals, etc.). Thus structural information is essential for material scientists to predict their thermal, magnetic and other properties.